In contrast to Zarathustra I was under thirty when I felt the burning desire to move off to the mountains. In fact it existed in me and just was waiting for a proper chance to be realized. At first there was theCarpathians, Alps, Tien Shan but nothing could be compared with the Himalayas, ‘the roof of the world’. ‘And why is Nepal so attractive?’ Actually, overwhelming majority of my acquaintances couldn’t realize the reason of such a long trip. A common person knows a few things about Nepal and the Himalayas, usually his knowledge ends with an immortal phrase of Nikolay Fomenko about a person who can be considered to be a citizen of Nepal, with a song ‘Let me go to the Himalayas’ and some people know that there should be Everest and Chomolungma (for the sake of the truth I should say that some people even knew that these are the names of the same mountain). But I was longing to leave for Nepal. And in a short time, I found a fellow traveler, a man who was interested in my plans of exploring. He was my class-mate, Dima. The idea to go to Nepal and see the highest mountains in the world struck me two years ago. And only in October 2004 our dream came true, having forced its way through misunderstanding and prejudice. And Nepal has become a country where the two of us want to return in, to come back forever. Well, a team consisting of two persons and representing Karaganda historico-geographical society ‘Avalon’ started on the journey to the wild (as many people think) places. At the beginning of the journey there was, as it should be, a train to Almaty, purchase of food and equipment, and then a plane of ‘Turkmen airlines’ took us to Ashgabad. During the flight we could easily observe geography of Middle Asia. Everything was clearly visible: Tien Shan, Fergana, Pamirs and Kara Kum. We had a short stop in Ashgabad and then a plain to Delhi, where we arrived at about 2 a.m.
Having arrived in Delhi we started our sleepless journey along India. We had no desire to be thieved at the beginning of our travelling and that’s why we had to fall asleep taking turns. Especially, after that when being in the airport krishnaist Andrey from Belorussia explained to us Indian people’s understanding of stealing: it’s consider if you are not keeping an eye on your things it means you don’t need them. Having fulfilled the honourable order we went to the station. We planned to leave our things in a cloakroom and go for a walk to see the city (an evening train ticket till Gorakhpur we providently had bought in the airport book-office). However, at the railway station we were disappointed: the price for leaving our things in the cloakroom was beyond the bounds of our resources. I should say that the railway station was not the thing to be delighted with (although it is the main station of the country), neither was the surrounding district. 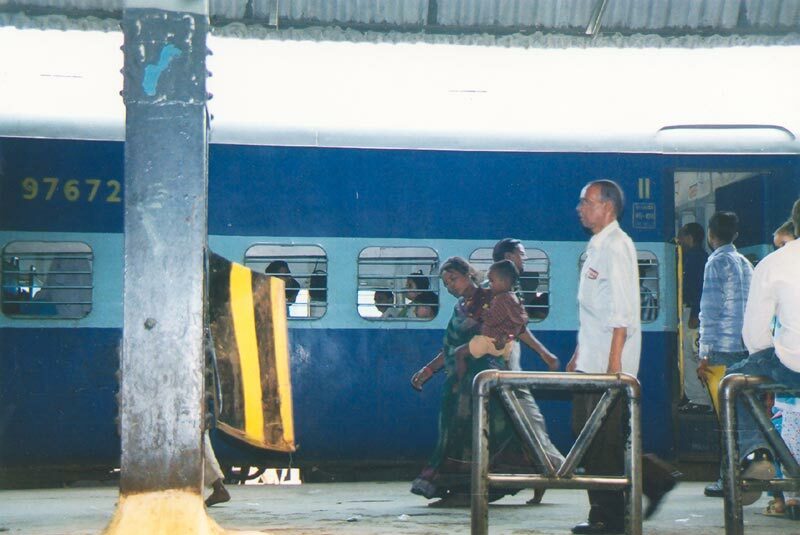 I have certainly heard that India is a dirty country … But the railway station in New Delhi exceeded all my expectations. Frankly speaking we were not eager to see the sights of the city any more. The air was saturated with dirt. That is why we decided to make ourselves comfortable (if it could be possible) and wait for the evening; we lay on our backpacks on the platform, eating taken from Kazakhstan dates and drinking some bought mineral water. I don’t know why, but for disinfection we just wanted to drink medical alcohol, to tell the truth we wanted and did it, occasionally. So, the day was declining to its end. In Indian trains there are no glass-panes. There are only bars. If you feel cold (I can say the nights are not so warm there) you may close the windows up with the help of some flitch plates. The half of passengers had fastened their things to the berths with steel chains. The second class of Indian trains has some resemblances with our carriages with numbered reserved seats, but in the worse interpretation. And soon the carriage was just a dormitory car, where people sleep even on the floor. There were three narrow berths on each side of a roomette, and you could hardly lie on them not to mention the problem of sitting on them. So, we had to sleep by turns again. We did not get pleasure from being watched by natives. We just automatically ask ourselves a question ‘Can they have never seen white people?’ Though, they could have never seen white people travelling by the second class. In the morning all Hindus started to brush their teeth. It’s a rather interesting procedure. They buy some wood sticks, which are sold buy barrow-boys, and start strenuously ‘brushing’ their teeth. In some minutes the stick looks like a whisk. I’m not sure if it’s a sufficient method of brushing but India does not seem a country to have a clear idea of the notion ‘neatness’. In Gorakhpur we made acquaintance with Adam and Georgia, we had noticed them in our carriage. After spending the night at ‘state of siege’, I think, they wanted to join hands with any whites to fight tooth and nail against importunate natives. Well, the enlarged group moved to the bus station and got on a bus to Sunauli. Adam and Georgia were from Canada. But they lived in Korea and worked as volunteers teaching English to Korean children, indeed. Adam had crossed the whole China from Urumchi till Hong Kong, and Georgia had come flying to Delhi at once. In Delhi they met each other and moved to Nepal. They planned to see Kathmandu and perhaps to visit one of the treks. Thus, our plans concerning Nepal did not coincide, but nevertheless it did not prevent us from spending good time together till the very trek. After arriving in Sunauli we quickly found the immigration office, drew up our exit registration and having made a few steps forward found ourselves under an archway. The arch bore an inscription Welcome to Nepal. It was another part of the city named Belahiya. It is the territory of Nepal. The distance between India and Nepal is 20 meters, but the difference is enormous! Everything is clean. People look more cultured, they wear jeans not worn-out rags. It doesn’t stink so pungent. In short, you can feel the breath of civilization. Thirty minutes, two filled in forms, thirty dollars and we got Nepalese visas. In Lonely Planet I’ve read that in Belahiya the hotels are more expensive and worse and there is no good buspark. It’s a very wise book (we have named it The Bible) and it advised us to go further to the city Bhairawa, which is situated four kilometers from the frontier. While reaching the city we were attacked by the representatives of local tourist business, and they were too intrude suggesting to spend the night, have dinner, give a lift etc. But we persisted in our going. I was driven by the natural bitchiness that made me screw those who wished to swindle out of all our money. This way we passed ‘four hot and miserable’ (according to Lonely Planet) kilometers till Bhairawa. There we bought the tickets to Kathmandu, settled in a hotel ‘Ashoka’, paid ridiculous sum of money (especially for Canadians) – $1 per person. Later we knew that this sum was usual price for Nepalese hotels. In the evening there was an international binge, during it a lot of beer was drunk, we condemned the residuary alcohol and also a bottle of cognac taken from our reserve. That’s why in the morning we were not afraid of brushing our teeth using running water, which isn’t considered useful for your health. In Bhairawa it was the first time we had ever tasted ‘momo’. This is the dish of Tibet cuisine, it has some resemblances with our pelmeni or manty. In our case ‘momo’ was cooked from the meat of buffalo, though it should be made from chicken or even vegetables. By the way ‘momo’ was the main food during our trip. The way to Kathmandu was long enough because of various block posts and checkpoints, which are situated in the distance of every 20 kilometers. I should say Nepal is at permanent war for many years. Though to the credit of the two belligerents (communist - Maoists and adherents of the king) it should be said that they don’t touch tourists, vice versa they are pampering them, because tourism is the main source for increasing the exchequer. Revolutionary Maoists fully appreciate the fact that without tourism the country will die and no matter what kind of regime it will have. Although from time to time there some excesses are observed. Arriving to Kathmandu we were taken aback. 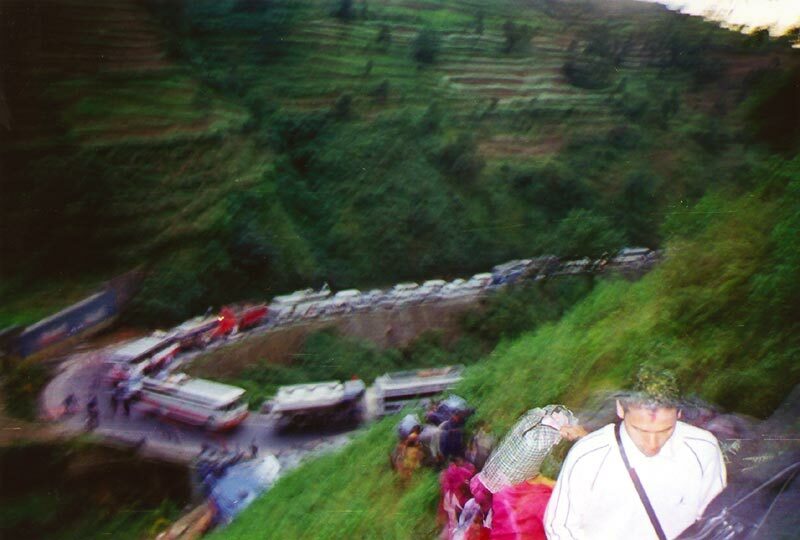 Because of the traffic checking there was a long a few-kilometer queue of buses and cars. And as the forecast for starting the traffic was not comforting (people were talking that it would last for 5-6 hours) we had to do something. Waiting was out of the question. It was about 5 o’clock and at 6 it is already quite dark in Nepal. So, having stood in a queue, we would get to the capital at midnight. It is really difficult to find a place to stop for night at this time in Kathmandu, almost impossible as the town’s life stops after 10 pm. They say, the ball comes to the player. And in this particular case we were the ball. An inhabitant weighed the pros and the cons of our trouble and made us a business offer. We would go on foot with him across the hill to the check point and from there he would find a taxi and take us to the best hotel in Kathmandu. And if we didn’t like the hotel, Lord forbid, we could feel free to leave it. Having nothing to choose, we agreed. It turned out that the trekking we expected to have near Annapurna started on the way to Kathmandu. We had climbed over 300 metres for 30-40 minutes, carrying all bags in complete dark, moving along a path in chain made of hundreds people. Having climbed up to the check point with great difficulty we used a bus and then a taxi to get to hotel ‘Tokyo’. As most of cheap hotels of the city, it is situated in its tourist center – Tamel. Apparently, there is no need to say that the next morning the promised price doubled and the man who brought us there was not in the hotel at that time (perhaps, he headed to wangle new clients). We scolded ourselves for our credulity and moved in the room that was two times cheaper. As for our ‘friend’, we tried to vanish at seeing him not to be screwed again. We quickly realized that in Tamel each individual is a tourist agency which can offer you every possible thing in Nepal.